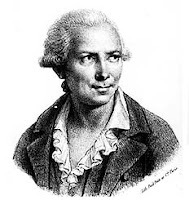 At Contre Gambit Philidor, Frederic Fournier analyzes my recent game as Black against Todd Lunna. On Saturday, I snapped these photos at the quads in Hamilton. 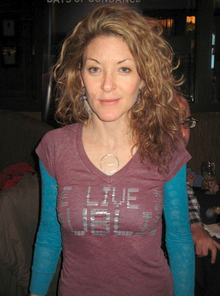 Katie Dellamaggiore [pictured, left], director of Brooklyn Castle, is interviewed by Ondi Timoner [pictured, right]. On Sunday afternoon, I drew this game at the quads in Westfield. 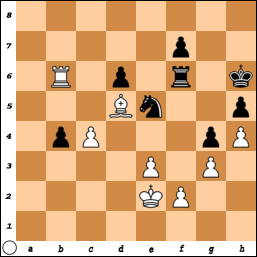 22.Bd7 Re7 23.Bxc6 bxc6 24.Qf5 Qg7 25.Re3 Re8 26.Rfe1 Rf8 27.Rxe4 Nxe4 28.Qxe4 Qf7, draw. 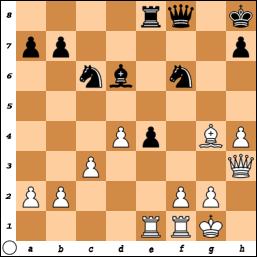 On Sunday morning, I finished with a score of 2-0-1 in the game/30 Swiss at Chess Mates. 15.Qb3 Bxf3 16.Qxf3 Nfxd5 17.Qb3 Nf6 18.Nxf6+ Rxf6 19.Be3 Kh7 20.Rad1 Nf5 21.f3 Nxe3 22.Qxe3 Qf8 23.Bd3 a5 24.b5 b6 25.Be4 Rd8, draw. Yesterday I finished with a score of 1-0-2 at the quads in Hamilton. 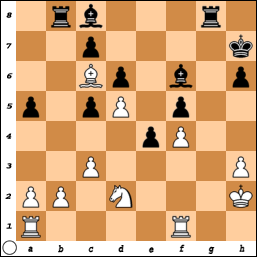 20.Kf1 Nf6 21.Bc6 g5 22.Rd4 Kg7 23.h3 h5 24.Ke2 Rh8 25.g3 g4 26.h4 a5 27.R1d2 Rh6 28.Rf4 axb4 29.axb4 Ng8 30.Ra2 Ne7 31.Bg2 Ng6 32.Re4 Rxe4 33.Bxe4 Ne5 34.Ra7 c5 35.Bd5 cxb4 36.Rb7 Rf6 37.Rxb6 Kh6, draw. 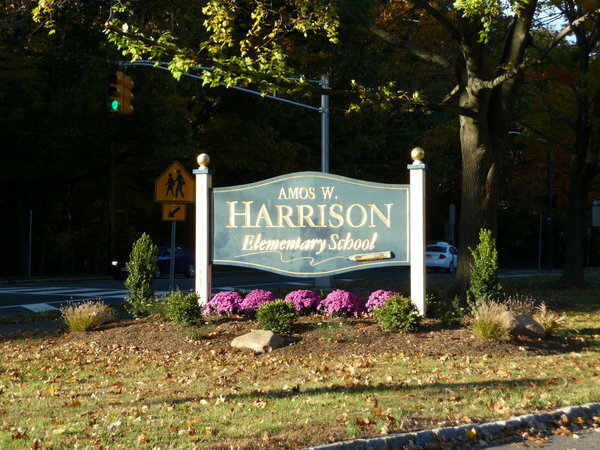 On Tuesday the 27th, I will start teaching an after school enrichment class on chess, run by Enrich and Grow Academy, at Harrison Elementary School in Livingston. 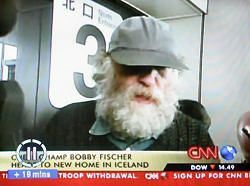 Watch a video of the award winning Finding Bobby Fischer by Jeremy Schaap. My Lecture @ "Contre Gambit Philidor"
At Contre Gambit Philidor, Frederic Fournier provides a link to videos of my lecture at the Marshall Chess Club. On Sunday, I won this game at the Marshall Chess Club. 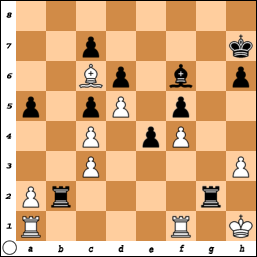 24.Nc4 Ba6 25.b3 Bxc4 26.bxc4 Rb2+ 27.Kh1 Rgg2, White resigns. 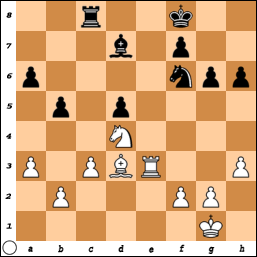 32.g4 Re8 33.Rxe8+ Kxe8 34.Kg2 Ke7 35.Kg3 Kd6 36.Kf4 Be8 37.Ke3 Bd7 38.f4 h5 39.g5 Ne8 40.h4 Ng7 41.b4 Bc8 42.Nb3 Bf5 43.Nd4 Bxd3 44.Kxd3 Ne6 45.Ke3 Ng7 46.Kf3 Nf5 47.Nxf5+ gxf5 48.Ke3 Kd7 49.Kd3 Ke7, draw. My lecture on the Philidor Counter Gambit, at the Marshall Chess Club, can be seen in high definition, as parts one, two, three, and four. Many thanks, to Hannibal and Jermaine respectively, for the original videos and the hi def videos! On Saturday morning, in the chess class conducted by Columbia Academy at Caldwell College, students handed in their homework assignments. 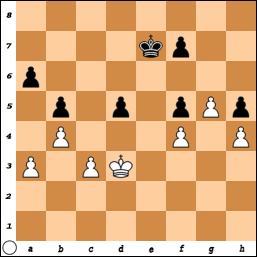 All but one had the correct answer 1.Qd6 which forces checkmate in two moves. 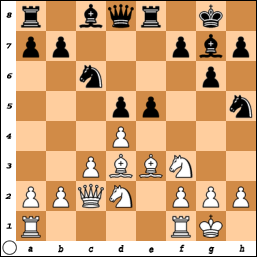 The other student liked 1.Rb1, forcing checkmate in three moves, which is the natural move from the diagrammed position. In fact, 1.Rb1 is what most masters including myself would have played in a real game, as opposed to a composition where counterintuitive moves are the key. At the demonstration board, I analyzed two recent endgames of mine from a tournament at the Marshall Chess Club. The first ending featured opposite colored bishops; the second, rooks and minor pieces. Ninety percent of endings with opposite colored bishops are drawn, even when one player has an extra pawn. 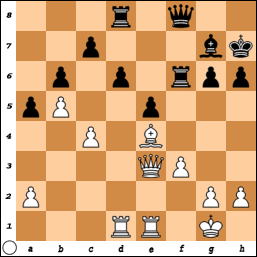 Bobby Fischer once drew such an ending when he was two pawns down! Rook and minor piece endings can sometimes be won by sacrificing an exchange (rook for minor piece), as happened in a variation from my game. 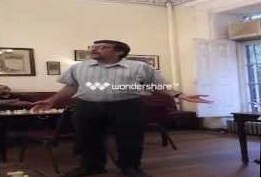 The class finished with a practical session. We will meet again in two weeks. There is no class next Saturday, due to the holiday weekend. Video of Katie & Pobo on "The Daily Show"
On November 8th, Katie Dellamaggiore and Pobo Efekoro appeared on The Daily Show with Jon Stewart. You can find my profile under "chess teacher" at LinkedIn. 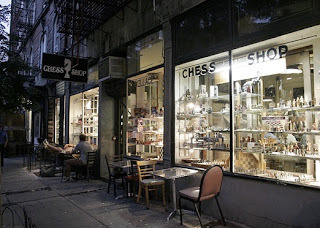 After 40 years, the Village Chess Shop on Thompson Street has closed. Katie and Alexis on "Starting Point"
I got a Castle in Brooklyn - that's where I dwell." Watch Katie Dellamaggiore and Alexis Paredes on Starting Point. Read Kenneth Turan's review of Brooklyn Castle. On Sunday, I finished the under 2300 tournament at the Marshall Chess Club with a score of 3-0-1. 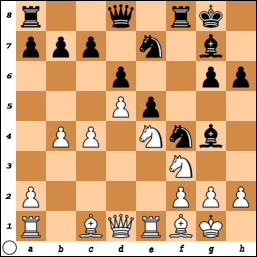 33.Rd2 Rb7+ 34.Kc2 Kc7 35.Kd1 Kd7 36.g4 Bb4 37.Nb3 Rc7 38.Ng5 Bxd2 39.Kxd2 Ke7 40.Nxh7 Rb7 41.Kc3 Bxd3 42.Ng5 Bb1 43.Nf3 Bxa2 44.Nfd2 Bxb3 45.Nxb3 a2 46.Na1 Rb1 47.Nc2 a1=Q+, White resigns. On Saturday, I was lucky to draw this game in the under 2300 tournament at the Marshall Chess Club. 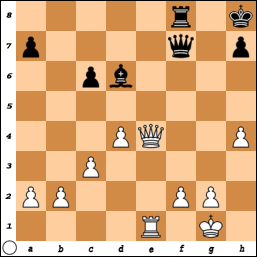 52.Kh6 Kxe5 53.Kxh7 Kd4 54.Kg6 Kc3 55.Kf5 Kb3 56.Be7 a3 57.Bxa3 Kxa3, draw. Last Saturday's chess class, conducted by Columbia Academy, at Caldwell College was postponed until yesterday due to the hurricane. Students found the right move ...Qh6# on their homework assignments except that they wrote the move incorrectly as Qh6# leaving out the three dots. 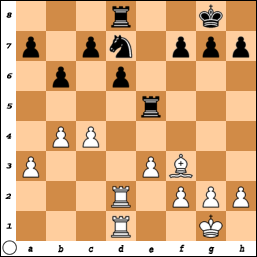 Remember to preface the move with three dots when it is played by Black. At the demonstration board, I presented an instructive endgame illustrating the superiority of the bishop over the knight when there are pawns on both sides of the board. In the game, Bobby Fischer showed excellent technique, which is the ability to convert an advantageous position into a winning position and then to convert the winning position into a win. Fischer put his opponent Mark Taimanov in Zugzwang by gaining tempos with his bishop while Taimanov's knight was unable to gain tempos in return. The ability to gain tempos is an advantage that bishops have over knights. Zugzwang means that you are obligated to make a move, and your only remaining moves are losing moves. 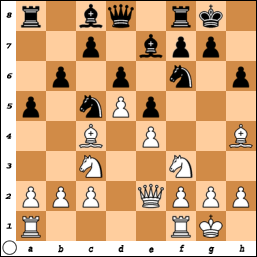 If the rules of chess allowed you to pass and not make a move, you could never lose such a Zugzwang position. The class concluded with a practical session during which the players kept score. All games were adjourned at the end of the class and will be resumed next week. 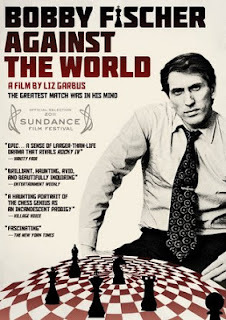 The film Bobby Fischer Against the World has been named best cinema documentary at the British Documentary Awards. In week ten of the U.S. Chess League, the New Jersey Knockouts found themselves eliminated from the postseason after drawing their match against the New York Knights, who advanced to the eastern quarterfinals. The games were played at full tilt on boards one, two, three, and four. 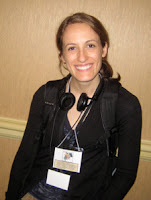 Katie & Pobo to Appear on "The Daily Show"